The Millington dispersal sale on behalf of Ashcroft Farms, York, held at Carlisle, peaked at 50,000gns for the four-year-old cow, Millington Highlight and her heifer calf, by Norman Hawk. By Wilodge Vantastic, out of Brockhurst Option, it has been a big winner in the show ring and sold to M. and J.C. Gould and Jonathan and Tom Waring, Shrewsbury. Next at 30,000gn was the November 2014-born heifer, Millington Juliet, out of Highlight by Ecran, which went to John and Pat Varley, Bradford. The original founder of the Millington herd John Wetherill, York, paid 12,000gns for the served heifer, Millington Joyous by Greenwell Fieldmaster and 10,000gns for 2012-born Millington Hilton, by Objat out of Brockhurst Option, with a bull calf by Norman Hawk at foot. At 11,800gns was the November 2015-born embryo heifer calf, Millington Lapwing, also by Objat and out of Brockhurst Option. Served by Norman Hawk, it was bought jointly by the Calogale herd of Messrs Lee, Kidwelly, Carmarthenshire, and the Frogmore herd of Chris White, Moreton-in-Marsh. The 2011-born Millington Gorgeous, a Mas Du Clo daughter out of Brockhurst Option, sold with a bull calf by Norman Hawk, for 9,200gns to Bruce Goldie, Mouswald. 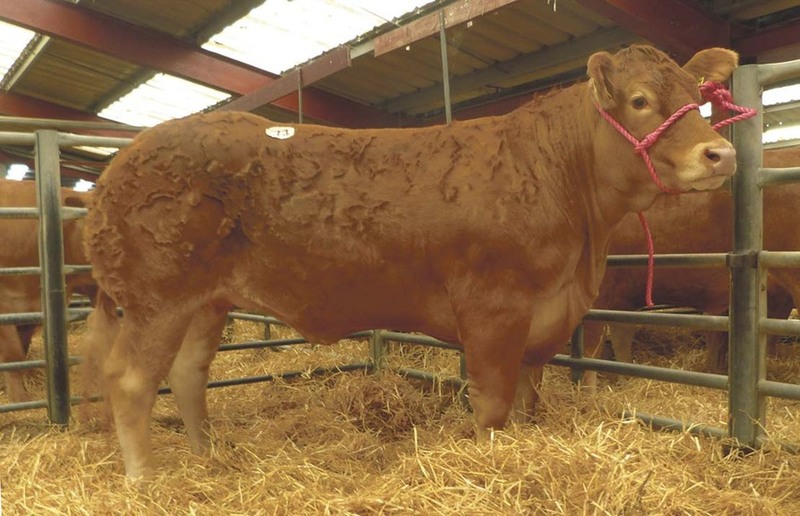 Selling for 8,000gns was Millington Jonquil, a 2014-born served heifer by Greenwell Fieldmaster, which went to the Breconside Farming Partnership, Moffat, Dumfriesshire. At the same money was the stock bull, 2012-born Norman Hawk by Claragh Franco. It was knocked down to the Barker Farming Partnership, Scorton, North Yorkshire. 46 cows served and/or suckling, £5,277.39; 4 embryo calves sucking recipient dams, £5,906.25; 18 served heifers, £4,369.17; 21 maiden heifers, £3,387.56; 1 stock bull, £8,400; 9 bulls, £2,286.67.